Public speaking Phobia or public speaking fear is a psychological obstacle that faces most of the people when they asked to deliver a presentation in front of people.Usually, this public speaking phobia stem from the way we think about public speaking. What if people laugh on what I say? What if I forgot something? What if I couldn’t answer their questions? What if I couldn’t convince them? And the list of questions goes on and on. To be condid,most of the people are asking themselves these questions In one way or in another before they speak.However,what makes the difference here is how willing you are to answer them and therefore to triumph your fears. Some people take the initiate steps whereas others remain passive, thus never make it through. To help you even further, look at some articles that I have posted in this blog that surely can help banish your fear. Making this fear vanished is not as easy as it sounds. It requires, however some time and energy to spend. Focusing the aspects of your presentation is the sure-fire way to do so. This ranges from researching your topic to organizing it, and from preparing it to delivering it. 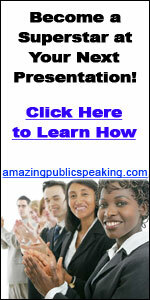 As I said, you can find articles tackling every aspect of your presentation in this blog. Being prepared and organized will certainly boost your self-esteem as well as self-confidence. In the meantime, it helps to minimize your fears and anxiety. Ultimately, I hope that you use what is contained in blog in your quest of banishing your public speaking phobia.